I was talking with a friend from Colombia the other day while she was making lunch. Since I started blogging I love to know what people are cooking in Colombian homes and she was making rice with chorizo. It sounded delicious, so last week I decided to make it too. 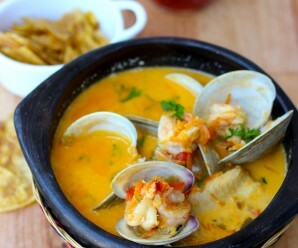 However, because my sister is here, I added shrimp for her and we liked very much. 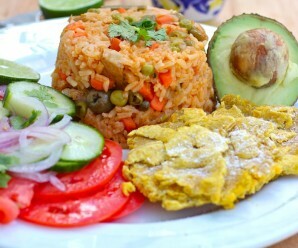 Rice with chorizo is a popular dish in the Andean zone of Colombia. Rice has been a staple in my diet my entire life and I love to eat and cook all sorts of rice dishes. 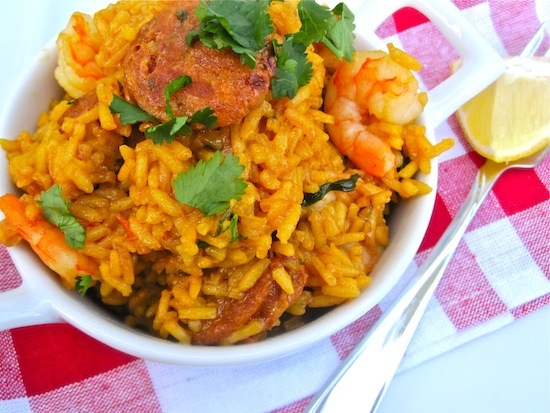 This Rice with Chorizo and Shrimp has an amazing flavor. Be sure to serve it with lime on the side. In a large pan over medium heat, add the oil and the chorizo. Sauté for 5 minutes or until the chorizo is brown. Remove and set aside. Add the onions, tomatoes, scallion and garlic to the pan and sauté for about 7 minutes or until translucent. Add the rice and stir to coat. Add the chicken stock, stir and bring to a boil. Add the chorizo and color. Reduce the heat, cover and cook for about 15 minutes. Add the shrimp and cook for about 15 minutes more. Turn the heat off and fluff the rice with fork. Add the fresh cilantro and stir. Cover and let sit for 5 minutes. I am drooooooooling. If you don’t have achiote, what’s a good replacement you recommend? Belinda- You can use sazon goya with azafran or turmeric. Loving the chorizo here, yum! Nunca he comido el arroz con chorizo y a la vez acompañado con gambas, pero seguro que tiene que estar estupendo. Solo hace falta ver tu plato, para darse cuenta de ello. Erica, this rice dish looks fabulous! Love it! 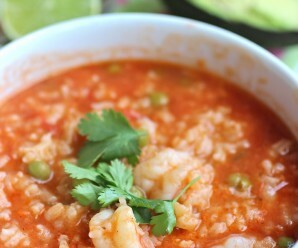 Love rice and shrimp and to have it all in the same dish, awesome! Looks sooo good! I don’t have Colombian chorizo right now, but I do have Mexican. Think that would be an acceptable substitute? This looks so good, I love rice dishes, and chorizo. Just got some chorizo yesterday to make some paella. Erica – I’m guessing it’s the sazon with azafran that gives the rice that gorgeous color? I have some of the sazon in my spice cabinet and haven’t used it yet. I definitely need to get it out and put it to use. This looks gorgeous! Kim- Sazon Goya with azafran or achiote! This rice dish looks so delicious! I am going to make it soon, hopefully with Columbian chorizo! Yum! 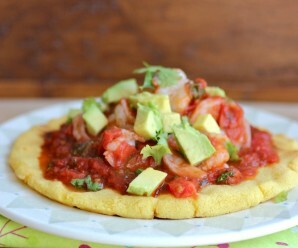 I love the combination of chorizo and shrimp–this looks perfectly delicious! That is a beautiful pairing of the spicy chorizo and the shrimp. That will have to be on our plates in the coming week. I don’t think i’ve gone more than 2 days during my entire life without eating rice. That said.. lovely recipe. If I can source some chorizo in the farmers market, I’ll give this a shot. Chorizo is the perfect thing to liven up any dish! Sounds delicious. Erica – another tempting and delicious sounding recipe. I love the flavors the achiote adds, but unless you have it already ground its a lot of work. Good tips on the sazon with azafran. Walked by a Columbian restaurant and thought of you as it seemed like half the menu was papusa. Must try it some day soon. You really kill me with your recipes! here I am stuffed after a big dinner and still could have a huge bowlful of that rice and more!! So loving the flavours and so having to try this somehow!!! Rebecca- I used Colombian chorizo (la Fe). This is a really beautiful rice dish! I love your addition of shrimp…delicious! This sounds just like jambalya. This looks so delicious. I’ve only tried Spanish chorizo. Is it the same? Simple and wonderful dish, Erica! 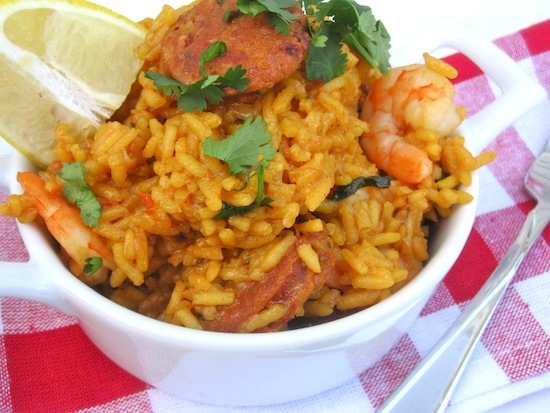 I love chorizo and I love rice dishes that use it like this one. Very colorful too!